Freestate MID-ATLANTIC PROSPECT SHOWCASE Player Registration is NOW OPEN!!! The Maryland State Lacrosse Coaches’ Association (MSLCA) is excited to announce some changes to what was formerly the FREESTATE Tryouts. This year the MSLCA will be sponsoring the Freestate MID-ATLANTIC PROSPECT SHOWCASE (M.A.P.S.). Similar to the FREESTATE tryouts this progressive SHOWCASE event will feature game play giving each individual player the opportunity to showcase their talents for the evaluators and college coaches. The MSLCA Freestate MID-ATLANTIC PROSPECT SHOWCASE will be open to any interested player in the 2022, 2021, and 2020 classes. The Freestate MID-ATLANTIC PROSPECT SHOWCASE is NOT limited to players from Maryland high schools. Any interested player may register; this includes players from DC, VA, PA, DE. The MSLCA Freestate MID-ATLANTIC PROSPECT SHOWCASE will accept player nominations from high school coaches as well as club coaches. The nomination process is free and easy! The Freestate MID-ATLANTIC PROSPECT SHOWCASE will offer two different divisions. The 2021/2022 Division is for any uncommitted players in the 2021 or 2022 classes. With the new recruiting rules this is a can’t miss event for any 2021/2022 player serious about playing in college. The 2020 Division will be focused on uncommitted players in the 2020 class. The 2020 Division will have a heavy emphasis as a D2/D3 Showcase as well as some DI coaches still looking to fill out their recruiting classes. The Freestate MID-ATLANTIC PROSPECT SHOWCASE is a can’t miss event for any Mid-Atlantic player looking to play in college. Similar to the former Freestate Tryouts the Freestate MID-ATLANTIC PROSPECT SHOWCASE will offer each player with a day one showcase with the opportunity to get invited back for a second SHOWCASE featuring the best players from Day 1 in the Freestate M.A.P.S. SELECT Games. All registered players will receive a tryout jersey to be worn throughout the entire process. Players invited back for the FREESTATE SELECT Games will also receive Freestate M.A.P.S. SHOWCASE sublimated shorts. 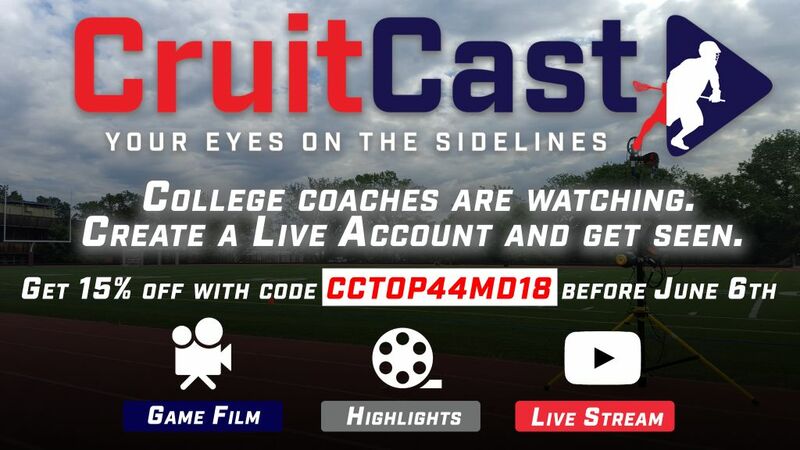 This year the MSLCA is partnering with Cruitcast to provide every player a free Cruitcast profile as well as access to game film from the Showcase all included in the registration fee. There will be NO EXTRA fees to get game film. Date and location TBD...it will be a midweek evening. IT IS VERY IMPORTANT THAT WE START ON TIME AND THAT ALL PLAYERS ARRIVE BY THEIR DESIGNATED CHECK-IN TIME IN ORDER TO GET SHOWCASE JERSEYS TO THE PLAYERS AND GET THE PLAYERS TO THEIR FIELDS ON TIME FOR AN 8:00AM START!!! All registered candidates must be at tryout location by the designated check-in time. SELECTION PROCESS: Only the first 132 applications will be processed per graduation year (see note below). All spots are on a first come, first serve basis. NOTE: After a pre-determined amount of numbers are assigned to individual positions, registration for that position will be closed and players may register for a WAITING LIST (no cost). You may only play one position at the SHOWCASE. During the SHOWCASE you will not be known by name, but by your number. This is done to keep the evaluators objective as they choose players during tryouts. After each round of the SHOWCASE the players who have been selected to continue will have their number posted on the MSLCA website www.mslca.org. You must access this site to determine if you have been selected.